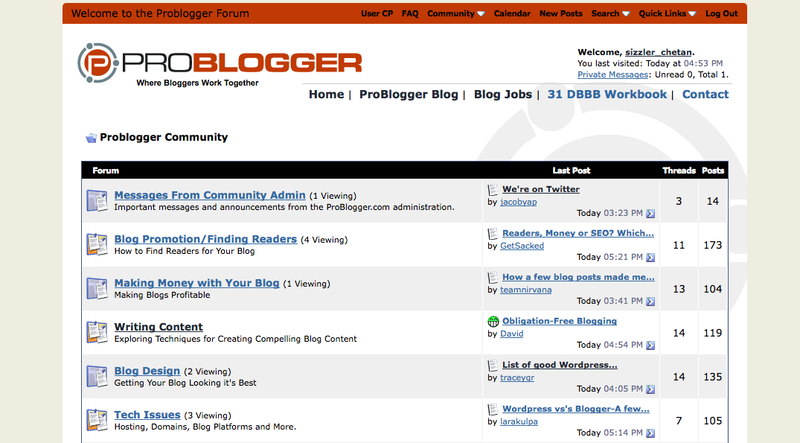 The Problogger Darren Rowse has launched a community, a paid one but affordable for every blogger who wants to learn something, wants to participate in some important discussions, and contribute their views. Its not openly launched by Darren from his side, as he certainly wants to have the community small and growing slowly initially, and would do launch it later, when time comes. The paid membership to join in the community is $1.95 per month, and you can subscribe monthly. Only earning might not be the reason for Darren to have this a paid forum, as he is hiring paid staff to keep the community neat and clean, away from spam, and also the fee although small, might keep all the spammers away. And as Darren, and the readers like me believe, that the forum is going to be a valuable place very soon, so paying something for it isn’t much! And for sure, the founding members who join in now, would be getting some benefits like one already told, 50% discount next month for the 31DBBB workbook. And this community for sure would be the best place to find bloggers of same niche whom you were searching for, interact and learn/share more. Check the Secret invite and join in if you feel you can help the community and your knowledge grow together in the blogging field.